Eight years ago, a landmark article in the journal Science — contributed to by Bates archeologist Bruce Bourque — offered a pair of conclusions that altered our understanding of marine ecosystems. First, humans had been depleting marine ecosystems far longer than anyone thought, practically since we learned to fish. Second, our management of marine ecosystems had failed to take into account the once-incredible abundance, like Columbus seeing the Caribbean swarming with sea turtles, of fish and other marine vertebrates. 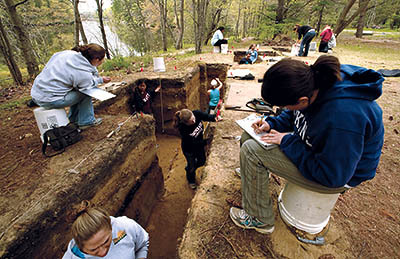 Bourque’s contribution was based on excavations of shell middens at Turner Farm, a 5,000-year-old indigenous settlement on the Penobscot Bay island of North Haven. There, he found evidence that prehistoric fishermen, using nothing more than bone hooks and hand nets, were able to deplete the nearshore population of Atlantic cod. For example, cod went from 74 percent of all fish bone fragments 4,350 years ago to just 2 percent 400 years ago. 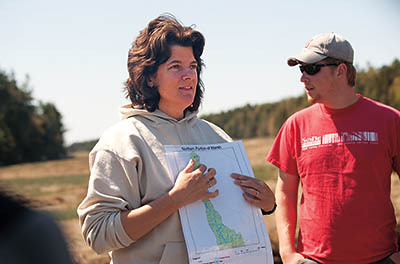 For Bourque and colleague Beverly Johnson, associate professor of geology, these ancient fish bones continue to yield clues not just about the past, but also about how to manage Maine’s coastal fisheries. Any effort to conserve marine resources is faced with “shifting baselines” — an uncertainty about what a healthy marine ecosystem actually looks like. For example, if prehistoric fishermen could overfish the cod stock, it’s little surprise that Maine’s marine ecosystems have been so drastically altered over the past century by modern fishing techniques. Today, fisheries regulators are constantly deploying various conservation strategies and tactics. Areas of the Gulf of Maine have been placed off limits. Fishing days and trip limits have been reduced. Rules about fishing gear and fish sizes are constantly changing. But any effort to conserve marine resources, says Bourque, is faced with “shifting baselines” — an uncertainty about what a healthy marine ecosystem actually looks like. 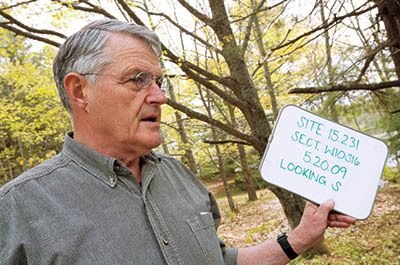 To help establish a better baseline understanding of the Maine prehistoric coastal ecosystem, Bourque and Bev Johnson, a geochemist, conducted isotopic analyses on some of Bourque’s archive of 20,000 fish and human bones from the Turner Farm site. Such analyses — done at Bates — can often determine, among other things, what these animals and humans ate. When Johnson’s students perform isotopic analyses of their own fingernail clippings, for example, “it is possible to discern vegans from omnivores, and students who summer in Europe from those who don’t,” she says. As they looked at the Turner site human bones, they learned that these ancient people mostly ate fish and shellfish (more often than deer and bear), further supporting the idea that prehistoric fishermen could have locally fished down their local ecosystem. On the marine side, Johnson and Bourque gained greater understanding of the ancient coastal food web — the complex who-eats-what relationship among predators and prey, from cod at the top down to “primary producers,” like kelp and seagrass, that fuel the base of the food web. The researchers found little change in this food web from about 4,350 years ago to the more recent past. Then, around 400 years ago, the isotopic analyses revealed a fundamental change at the base of the web: Kelp or seagrass was disappearing. “It begged to be further investigated,” says Johnson. She had an inkling. Given that kelp currently dominates nearshore food webs, she wondered if seagrass was once much more abundant and more important to the food web than it is today. For Johnson, adding to what’s known about an ecosystem at the cusp of human involvement is as good as it gets. The results confirmed Johnson’s hunch. From about 4,350 years ago to 400 years ago, seagrass was as important as kelp to Maine’s nearcoastal marine food web. From that idea, she infers that seagrass was itself more plentiful in prehistoric times than it is today. And if seagrass was once key to the pristine Maine coastal food web, then logically “we need to restore and preserve current seagrass beds,” says Johnson. Generally, it’s thought that seagrass began its decline with the arrival of Europeans, perhaps due to increase in water turbidity due to settlement. The questions, of course, keep coming. Was the historical decline in seagrass a local or regional phenomenon? What was the exact timing of this change? In fact, Johnson, Bourque, and colleagues like Bates biologist Will Ambrose and Robert Steneck of the University of Maine are seeking National Science Foundation funding to support further research.